Dave Colina is the co-founder of O2 which started in Columbus, OH in 2014. O2 Oxygenated Natural Recovery drink was created by a CrossFit trainer and a medical doctor who was sick of unhealthy sports and energy drinks. O2 has electrolytes, natural caffeine, and added oxygen to help your body process toxins faster. 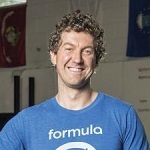 Dave has gone from slinging O2 out of the back of a Prius to becoming a top seller at hundreds of CrossFit gyms and Whole Foods stores in Ohio, Kentucky, Pennsylvania, DC and Maryland as well as Krogers. [1:18] Jeremy introduces his guest, Dave Colina. [2:30] Mistakes made along the way. [12:00] Correcting a mistake and sticking to the value of honesty and transparency. [16:00] A high point on the journey. When was the last time that you learned from a mistake or miss opportunity? Do you make a habit of taking the time to learn from mistakes and challenges you face along the way? On this episode of Inspired Insider, you’ll hear from business leader Dave Colina. In his conversation with Jeremy, Dave opens up about mistakes he’s made, how he solved a massive challenge in his business, a high point that he is especially proud of and much more! You don’t want to miss a minute of the valuable insights that Dave has to share! How have you responded to mistakes and setbacks in your career? Have you turned them into lessons you’ve learned from or do you look back on them bitterly? For Dave Colina, the journey to build O2 has been anything but smooth. The common thread through Dave’s career has been a resilience and a determination to keep going especially when things look bleak. This mindset has served Dave and his team well, though all the highs and lows today, O2 is a thriving business with a bright future. What can you learn from Dave’s story and the struggles they’ve endured at O2? Every company has a set of values that they build the organization around. Often a company has their values displayed prominently in their building but those aren’t always the same set of values that the company operates under. The amazing thing about startups is the ability to shape these values and the culture from the ground up. Dave Colina and his team at O2 are committed to championing and expressing the values of honesty and transparency. Case in point, when a labeling error occurred on an order of over 300,000 cans, Dave and his team decided that the best solution would be to admit their mistake and put their values on display for the public to see.